The year 2016 is the year Khukuri House celebrated its 25th anniversary being in this Khukuri knives business becoming the oldest Khukuri manufacturing company to craft Traditional Hand Crafted Khukuris from Nepal. During this time frame, this House has produced over hundred plus varieties of Khukuri blades from its stable by its most skilled craftsmen. Every product or model equally better in quality and strength proving to be world class tool for all Khukuri user world wide. Its been a decade or so that there has been just too many Khukuri new modification going on with this simple elegant blade. This beautiful yet simple blade were now turned into very complicated and ugly looking because of the weird modification, giving the blade some strange shapes and with strange weird handles. The Khukuri we once all loved being simple and gorgeous no longer looked like a Khukuri and not to mention the funny names many of the new Houses called them with. I, Sanjay Lama/Dumzon no longer could stand this punishment done to this stunning blade so is why I stepped in to make one Khukuri so as simple as it can be, hand made from the start to the end and to appear to look Handmade. I asked my most skilled craftsmen to pound and clubber so hard that we could see Hammer marks on the surface of the khukuri knife. So gathering all our expertise that we have gathered and learnt from all the years spent being in the business, we gave birth to this beautiful yet simple Khukuri blade from this house. 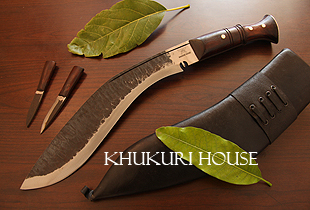 This house is so proud of this khukuri as it tends to uphold the reputation being the oldest handmade Khukuris from Nepal. You haven't yet got a True Handmade Khukuri from Nepal if you don't have a Khukuri Dumzon yet.